Discussion in 'Sesame Merchandise' started by Phillip, Apr 2, 2012. 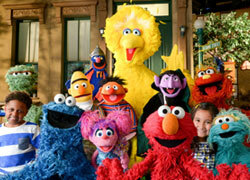 "Being Elmo: A Puppeteer's Journey", the documentary of Kevin Clash, will finally arrive on DVD this Tuesday April 3. Here's our review of this anticipated DVD release. Check it out and let us know your thoughts. Since most of us will be getting "Being Elmo", we'd like to mention that if you order the DVD or digital download from Amazon using this link, that a small portion of your entire order will go to Muppet Central to help keep the site, forum and radio running smoothly and help make future upgrades possible. It's a great way to help MC and get a great price on the DVD or digital download. We greatly appreciate each person that helps support MC by placing orders through links on our site. “Being Elmo” also premieres on Independent Lens Thursday April 5 at 8 pm central, 9 pm eastern on most PBS stations and is available for streaming via Netflix and iTunes digital download. Once you watch "Being Elmo", post here and let us know your thoughts on this anticipated release. KermieBaby47 and Muppet fan 123 like this. Yee-ha! Can't wait to get it on dvd! Went to Best Buy and picked it up this morning. They didn't have it out on the new releases stand but they had it on a cart with a bunch of other DVDs getting ready to be stacked. I didn't know if I could take it or not but after a 1/2 hour of waiting as the staff didn't seem to want to touch the discs at all, I just took one and bought it cheap. Watching the bonus features right now. Muppet fan 123 and Cindy like this. Well, I just read Cindy's review, and even though I've seen this on Netflix, and it'll be on tv in HD in a couple nights, looks like I'm gonna buy the DVD, lol. It's the bonus features that are the clincher, for me at least. I just love me some extras, especially when they're more interviews, and q & a's are the BEST! Can't wait, and thanks for the awesome review Cindy! I love it! My only compliant is that the sound is so low that, you have to turn the volume way up. Just picked up a copy at Barnes and Noble, after no luck at Target or Best Buy. I probably payed a little more for it at B&N but at least I avoided Walmart. Going out at 9:00 means I'll have to wait til tomorrow to watch it. I picked up my copy at Best Buy. I was kinda surprised to see it there, but sure enough it was sitting on the shelf of the Documentary section. I think there were only 4 or 5 copies available. I first saw the film at a screening in Baltimore MD where Kevin Clash & Elmo made an appearance for a Q&A session and I've watched it a couple times on Netflix and I love the film! When I came home with the DVD the first thing I did was watch the bonus features! I love seeing the footage of Tau Bennett living a dream in the Sesame Street Macy's float with Baby Bear on his arm. I also loved the seeing Bill Barretta stop his interview to call Kevin about making crab cakes! LOL!!! I loved this film and hoped it would have a little more depth into the life of Kevin Clash, but it glossed over a lot of personal bits. 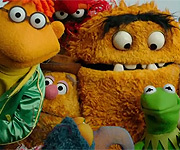 I was impressed how much access that Sesame Workshop allowed and how much exposure into the process the film revealed. I cried five times during this picture. That was unexpected because the red fella isn't a particular fave because I didn't grow up with him. The documentary really tugs at the heart strings. I hope they make more of them for other performers like the new Spinney documentary coming soon. I also hope they go into greater personal depth too. theprawncracker, Muppet fan 123 and BobThePizzaBoy like this. Yeah, something about the DVD sets me the wrong way. Not so much the movie or the bonus features, just the way it's presented. I don't know what it is. Maybe it's the fact I have to battle the volume when I have the DVD or the fact that the menus seem a bit DVD-R-ish. But that's just me, it's worth it just for the movie. I actually kinda liked the clean menus. The bottom nav reminded me of Blu-ray and that's kind of my one big complaint. Why wasn't this released on Blu-ray? I also had sound issues, but i live in a noisy neighborhood so that seems normal. They had no subtitle option. That's rare these days. But I liked the movie a lot. I just wanted more! I agree about the sleek/clean look of the menu. It's a documentary not an overly done Hollywood production. I would expect some minimalism when it came to how it was packaged and produced. I didn't think about subtitles, that's a good point. The menu music versus the audio in the film was definitely an issue for us, but not one that we couldn't overcome. I wanted more as well. And like Jamie I would have like to see more personal Kevin Clash moments but knowing how private he is, I was just pleased to see those rare moments with his daughter. I wanna watch this I just don't know what time it'll be on. There aren't any PBS stations in Canada, but I watch it from the Burlington PBS, and another (I don't remeber which one). Is Independant Lens a station or is that part of PBS? I CAN'T WAIT!!! I wanna see this movie so badly! I wanna watch this I just don't know what time it'll be on. There aren't any PBS stations in Canada, but I watch it from the Burlington PBS, and another (I don't remeber which one). Go to this page pbs.org and then select "Choose Your Local Station". Put in the station you watch and then you'll see when the series Independent Lens comes on. For most people, it will be 8 pm central, 9 pm eastern tonight. OK. That's good to know, but will there be ad breaks? I see on a schedule that it's on at 9:30, but it doesn't say Being Elmo, it says Independant Lens, is that it? Yes, that's it. See if there's a description of the program listed to know if "Being Elmo" is airing in your area. Thanks. I'm going right now to try out all these channels that could possibly be the one that I have. I have a whole list of channels with me now, I just hope Bell TV has all these channels. I haven't bought the DVD yet, but I'm wondering, does this documentary include any of Kevin Clash's other Henson work besides Sesame Street?